The decisive winner of his only point-to-point start for trainer Ian Buchanan at Farmaclaffley, Co Armagh, in February, 2004, Knowhere was subsequently bought by Raymond Mould and transferred to Nigel Twiston-Davies’ Naunton stable. He landed his first two starts for his new connections that October, sauntering home in a novice hurdle at Hexham and following up in the Grade Two Persian War Novices’ Hurdle at Chepstow, edging out Ladalko by a neck, before injury kept him off the track for 15 months. He reappeared in January, 2006, making his chasing debut in the Grade Two Dipper Novices’ Chase at Cheltenham, but never looked entirely happy during the race, pulling up before two out, and was not seen out again that season. Knowhere was sent to Perth for his comeback race in the 2006/07 season, over an extended two and a half miles in September, when he treated his rivals with contempt to score by an easy 23 lengths, and the gelding landed another comprehensive victory at Bangor the following month over the same trip, coming home 15 lengths in front of Steppes Of Gold. Pitched into handicap company in the Grade Three Paddy Power Gold Cup at Cheltenham in November, 2006, Knowhere was travelling well in the lead when falling at the eighth fence, and, after a runner-up finish to Cerium in Grade Two company at Ascot on November 18, returned to Prestbury Park the following month for the Grade Three Boylesports.com Gold Cup, producing a career best effort to run the highly progressive Exotic Dancer to a length and a half. Dropped back into novice company in the Grade One Feltham Novices’ Chase at Kempton on Boxing Day, 2006, Knowhere could only finish third to Ungaro, and did not shown his true ability on his two following outings at Cheltenham, running eighth in the Grade Three Ladbrokes Trophy Chase on January 27, 2007 and 12th behind Denman in the Grade One RSA Chase. Lining up as a novice in the 2007 John Smith’s Grand National, Knowhere fluffed his lines at the Canal Turn on the first circuit, unseating Tom Doyle. Last season Knowhere again proved himself to be one of the top chasers around, winning a handicap chase at Cheltenham on his seasonal reappearance in October before returning to the Cotswold track to finish a close third behind L’Antartique in the Grade Three Paddy Power Gold Cup the following month. A rare foray away from Cheltenham saw Knowhere line up in the Grade Three Hennessy Cognac Gold Cup at Newbury two weeks later, when he put in another spirited display of jumping to finish fifth behind Denman. He made a swift reappearance in the Grade Three Boylesports.com Gold Cup at Cheltenham under first time blinkers, but the hard Newbury race took its toll and he was pulled up after a mistake three fences out. Knowhere began 2008 with a deserved Grade Two success over fences, coming with a strong challenge to beat Our Vic in the Letherby & Christopher Chase at Cheltenham at the end of January. Having been successful in the recognised trial for the totesport Cheltenham Gold Cup, Knowhere fully deserved to take his chance at The Festival, but the gelding made several mistakes under the strong pace and eventually faded to finish sixth behind his Newbury conqueror Denman. He then returned to Aintree for a second crack at the John Smith’s Grand National and was still travelling well enough when unseating Joe Tizzard at Valentine’s Brook on the second circuit. Last season ended when he was pulled up in the bet365 Gold Cup at Sandown. The current campaign began with a decent win in the Grade Two intercasino.co.uk Old Roan Chase at Aintree in October when he defeated the high-class Exotic Dancer by a length. Next time out he finished eighth to Madison Du Berlais in the Hennessy Gold Cup at Newbury while last time he was a distant 10th to Kauto Star in the totesport Cheltenham Gold Cup. Paddy Brennan, who was born at Ardrahan in County Galway on April 13, 1981, spent the summer of 1995 working for County Kildare handler Gerry Stack before embarking on a five season apprenticeship with the leading Irish trainer Jim Bolger, for whom he rode eight winners. The first of those came on Ivory Isle at Gowran Park in August, 1998. 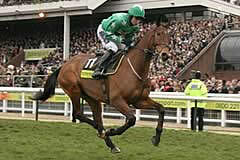 He became too heavy and tall for the Flat and moved to Paul Nicholls' stable as a conditional jockey in 2001. He stayed there for two and a half years, riding winners for Nicholls and Jeff King, before joining Philip Hobbs in the 2003/04 season as one of that yard's conditionals. Brennan also struck up a good rapport with Ashley Brook, on whom he won the Grade One Maghull Novices' Chase at Aintree in 2005, and enjoyed a first Cheltenham Festival success that year aboard Shamayoun in the Fred Winter Juvenile Handicap Hurdle. Brennan was appointed as retained rider to owners Andrea and Graham Wylie for the 2006/07 season after dropping by trainer Howard Johnson's County Durham yard for a cup of tea and toast. He rewarded those connections when guiding Inglis Drever to victory in the 2007 Grade One Ladbrokes World Hurdle at Cheltenham - the gelding's second success in the race. Brennan, who wanted to return to the south of England, left Johnson at the end of last season and joined Naunton-based handler Nigel Twiston-Davies last season. He tasted success over the big Aintree fences in November, 2005, when he was carried to victory by Hakim in the totepool Grand Sefton Handicap Chase. He was travelling well on Bewleys Berry in the 2007 John Smith’s Grand National, until the gelding fell at Becher’s on the second circuit. This year he has enjoyed another good season, with his biggest successes coming aboard Imperial Commander, trained by Twiston-Davies, in the Paddy Power Gold Cup and the Ryanair Chase at Cheltenham.